Veterinary Technology is the study of procedures used in the medical care of animals. 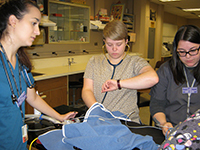 Veterinary technicians are trained paraprofessionals working under the direction and supervision of veterinarians. Jobs as veterinary technicians are available in large, mixed and small animal veterinary practices. Job opportunities are also available in the fields of research, primate centers, zoos, regulatory medicine, veterinary product sales, and similar areas. A graduate can expect a starting salary in the range of $2,100 to $2,500 per month. Advancement in salary comes with practical experience. Note that this program is not a pre-professional track to becoming a veterinarian. Students wishing to pursue the DVM (Doctor of Veterinary Medicine) degree to become veterinarians should contact Dr. Hurtado for assistance in planning a two-year program of study that will transfer to additional education.